Instead of capitalising on her very enjoyable second album (2011’s ‘The Storm) with another set of specially written melodic rock tunes, on this third outing, Norwegian songstress Issa and her band venture into the wobbly world of the covers album. It would have been easy for Issa to wheel out a few of AOR’s best-loved tunes and consider that a job well done, but the results on ‘Can’t Stop’ are more interesting than that. Instead of plumping for the genre’s hits, Issa puts her mark on the near misses, the should-have-been hits. The choice of material is excellent – this dig through the archives of melodic rock offers tunes just obscure enough for some listeners to be hearing a few of these songs for the first time, while reminding the more seasoned melodic rock fan of a few overlooked gems in their treasured vinyl collections. Although the highlights on this disc are many, ‘Can’t Stop’ is a release that preaches to the converted, but with that in mind, many long-term AOR fans will enjoy hearing these tunes covered almost verbatim. Although a near faultless selection, it’s possibly ‘If You Ever Fall’ which stands up the strongest. Originally recorded by Mystic Healer – a project helmed by AOR legend Mark Mangold (released via the now defunct MTM label in 1998) – it already had a decent pedigree. In the hands of Issa, an already superb number is given a great rendition. Harnessing the song’s power and delivering it at a slightly different pitch, Issa’s vocal gives the track a very Robin Beck slant. Almost as good – and one of the records most obscure picks – ‘Heat of The Night’ (a tune released by Worrall in 1991) is a vast improvement here. The Worrall recording showed promise but was low-budget and very trebly sounding. Issa’s 2012 recording has a wonderfully full sound with plenty of bass, a truckload of classic sounding keyboards tinkling away in the AOR tradition and, perhaps most importantly, a powerful vocal. Making the best of a memorable hook, Issa takes a once okay tune and pushes it up to a level worthy of her female melodic rock predecessors. …And, of course, if you’re interested in this project, that’s exactly what you’d want from it. The title cut originally appeared on the Aviator album back in 1986, and since that album is somewhat of a cult classic, it’s great that the team behind this release have chosen to resurrect it. The eighties production has been downgraded to the slightly woolly sound present on a lot of Frontiers releases, meaning the drum sound isn’t so crisp and there’s little to no separation between the rhythm guitars and bass, but the lead vocal is strong and the unashamedly 80s keyboards are present and correct. Production quibbles aside, each of the band members does their utmost to try and make this as memorable as the Aviator recording, particularly keyboard player Allesandro del Vecchio and guitarist Mario Percudani who launch into a musical duel for the instrumental break. Sadly, Issa’s recording of Tower City’s ‘I Won’t Surrender’ doesn’t fare quite as well as most of the tunes here. It’s nothing to do with the performance, since the brilliance of the song still shines through; the big issue here concerns the production values. The crisp brilliance of Akron, Ohio’s finest Def Leppard impersonators has been compressed somewhat, almost reduced to a second division mushy sounding recording in comparison. Thankfully, much like the Worrall and Regatta tunes, ‘State of Love’ (originally recorded in the mid 90s by Mark Free for Now & Then Records) stands up well to both a female vocal and the slightly compressed production. One of the tougher songs from Free’s slightly drippy solo album, it sounds just lovely here – the combination of stabbing keys, noodling bass and occasional twin lead guitars embodying something close to genre perfection. A hugely underrated band (especially considering they had Thin Lizzy’s Scott Gorham at the helm), 21 Guns are represented by two numbers ‘Just a Wish’ and ‘These Eyes’. Regardless of the outcome, anybody wishing to applaud the genius of Scott Gorham should be applauded in return, but thankfully, both tunes fare extremely well. On ‘Just a Wish’, Issa’s style really suits the power ballad format, but it’s not her fist-clenched emotion that’s this track’s strongest feature: although brief, Percudani’s guitar solo has plenty of presence. …And as he launches into a string of long and emotive notes during the song’s fade, you may find yourself wishing they’d let him play just a little longer. ‘These Eyes’, in contrast, was a great emotionally charged rocker in the hands of 21 Guns and very little has changed here. This cover version includes a fatter bassline than the original recording could muster, while the main keyboard riff – played in a slightly lower register – sounds more like a sampled xylophone! Despite best efforts, Percudani’s guitar solo isn’t quite up to Gorham’s original take, but that doesn’t detract from both 21 Guns covers being among ‘Can’t Stop’s highlights. Elsewhere, Issa pays tribute to other works wholly unknown outside the AOR community with covers of songs originally by Unruly Child, Atlantic, Tangier and Boulevard, each with a deserving reverence, adding a few extra reasons for most melodic rock fans to give ‘Can’t Stop’ a listen. On the back of the release of their comeback album ‘Push & Shove’, the reunited No Doubt have taken to the road. They bring 2012 to a close with a seven night residency at the Gibson Amphitheater in Los Angeles on the following dates. It has been confirmed that Joe Satriani will play live shows in the UK in 2013. The guitarist last visited the UK as part of Chickenfoot, but has not played solo shows in Britain since 2010. A half hour interview with rock vocalist John Corabi has been posted on YouTube. The chat, conducted by Rome By Wild can be seen below. The singer released various albums with ex-Kiss man Bruce Kulick under the name Union, but will still be known by many as vocalist with early 90s rockers The Scream and for his short stint replacing Vince Neil in Motley Crue. An acoustic career retrospective, ‘Unplugged’ will be released in November 2012. Metal may have evolved into various subgenres since the early 80s, but there’s always time for something “traditional”. If you want classic metal delivered the way it used to be, look no further. Bands like Three Inches of Blood may be incorporating huge amounts of squealing, all guns blazing 80s metal into their sound, but few have nailed New Wave of British Heavy Metal / classic 80s metal sounds as well as Monument. On this self-released debut EP, this British band pick up the mantle take some very obvious cues from classic metal bands (Iron Maiden, especially) and offer five full-on rockers which are drenched in a glorious sense of nostalgia. The title track comes full pelt with hammering drums and squealing vocals filling its intro, before the band settles firmly into a metal attack which resembles very early Iron Maiden, albeit played a tad faster. 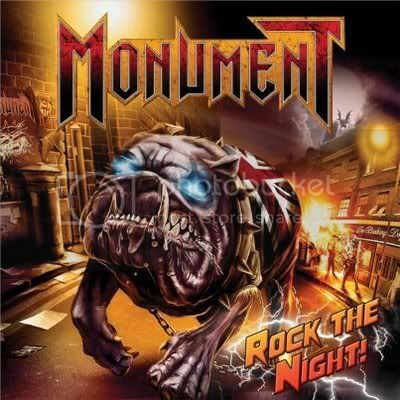 By the time the band warm up to full speed, Monument sound like an old-school metal juggernaut, and from this point, there’s no slowing down. Extra interest comes from a shred filled lead guitar break courtesy of Judas Priest’s Richie Faulkner, whose playing – unsurprisingly – compliments both Monument guitarists (Lewis Stevens and David del Cid) excellently. Frontman Peter Ellis is far from being as gifted as Bruce Dickinson, but on this track (and, indeed, the subsequent four) his slightly harsh vocal isn’t too much at odds with the band’s overall style. A stronger Iron Maiden influence pervades the rest of the EP, to the point where it’s not just the overall style that’s been influential – you can pick out bits of actual Maiden songs! With Matt C’s drums thundering at top speed, ‘Carry On’ delivers an even more powerful old-school metal assault. The twin lead guitars in the intro are absolutely marvellous, but within about thirty seconds, the tune shows its true colours as it begins to resemble the Iron Maiden classic ‘The Trooper’ – something hammered further home by a very similar “whooo—ooo-ah!” during the chorus. If you were feeling kind, this could chalked up as “strong influence”, but, in reality, it’s more than that – Steve Harris ought to be claiming songwriting royalties… Similarly, ‘Midnight Queen’ comes with some amazing twin lead work, underpinned by so much of galloping bassline, you’d be forgiven for briefly believing this was a leftover from Maiden’s ‘Piece of Mind’. It’s really only the slightly shinier production value that belies the tunes post-eighties origins. The ‘Trooper’-eque whoas make a timely return, Ellis’s slightly gruff lead voice is balanced well by a few choice harmonies and Jim Ramses rattles his bass strings with intent. When referencing the past, there’s a very fine line between genuine influence and blatant plagiarism. In more than a few places, Monument cross that line rather too obviously, to the point where they’re positively taking the piss. Somehow, though, ‘Rock The Night!’s over-familiarity is what ultimately makes it so enjoyable, at least in the short term. Looking at the bigger picture, since there’s a lot of musical talent within Monument’s ranks, it’s a shame they didn’t use those talents a little more creatively.